Copics are some of the best markers for coloring. They are used by professional artists and illustrators all around the world. These are top-quality alcohol-based markers that will last a lifetime if you take care of them. However, these benefits do not come without a hefty price. It can be hard to decide which type of Copic to buy since they cost more than other art supplies. With that in mind, we created this guide to help you decide which marker is right for you. 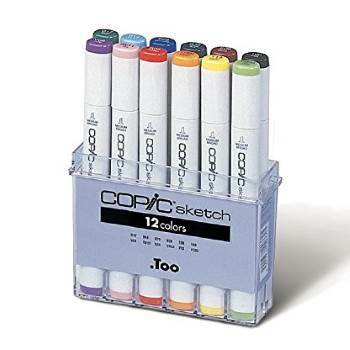 The Copic Sketch Marker is the company’s flagship marker. These markers are the top-of-the-line for the brand. They come in every color, and most colorists agree that they are the best markers for coloring. It’s really easy to quickly lay down smooth, even colors with these markers. They also use an alcohol-based ink and were specifically designed for blending. The Sketch comes in 358 colors, which is the largest variety of colors. It comes in every color that Copic offers. That means that you have 358 different colors, shades, and hues to use in your artwork. However, it also means it’s going to take a lot of time and money to collect the whole set. The Sketch comes standard with a Super Brush nib and a Medium Broad nib. The Medium Round tip will also fit, but must be purchased separately. The marker is double-ended and comes with a useful nib combination. The Super Brush is springy and flexible; use it for blending and shading. This tip is more like a paintbrush or a brush pen. The Medium Broad nib is firmer and angled like a chisel. It’s good for filling in large areas and blocking in colors, but not so great for detail work. You can refill a Sketch marker twelve times from one Various Ink Container. The Sketch is the second-smallest marker in this list, but it still holds a lot of ink. New markers will last a long time before running dry. 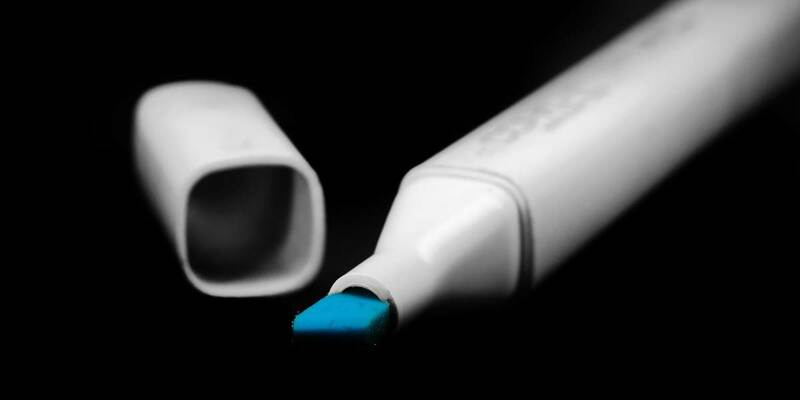 When the color starts fading, a refill cartridge will provide enough ink to refill the marker 12 times. The Sketch marker has an oval shape feels comfortable in small or large hands. The Sketch is larger than the Ciao but smaller than the Classic. It isn’t perfectly round; the barrel of the marker is ovular. This makes it easier to hold and keeps the markers from rolling around on the table. 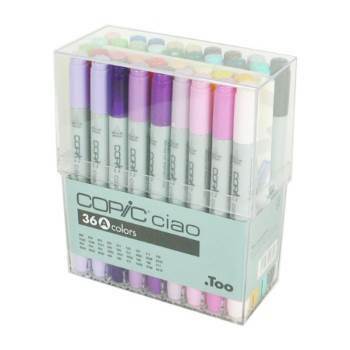 The Copic Ciao Marker is the company’s entry-level marker. They are great for children and beginners. 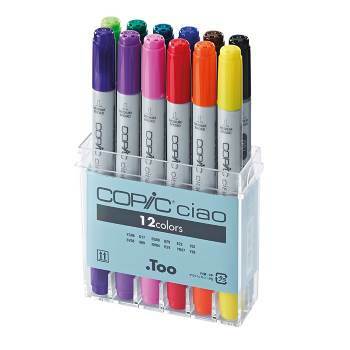 If you want to try out some Copics without spending too much, the Ciaos are for you. These markers are the cheapest of the four, but Copic didn’t sacrifice quality to bring the price down. 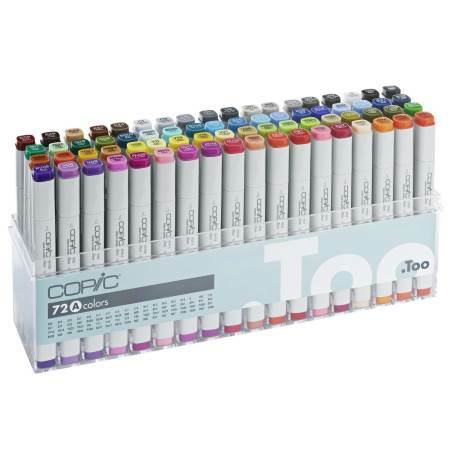 Ciaos only come in half of the colors Copic offers, but that’s still plenty of variety. 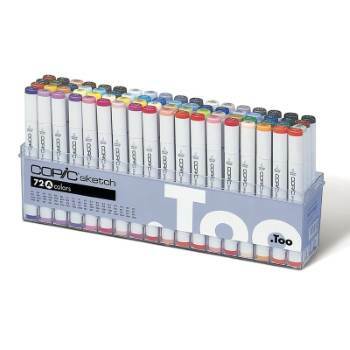 The Ciao comes in 180 colors, which is about half of the colors Copic offers. Most colorists should have no problem making due with 180 colors. If necessary, you can mix and match marker types to get all the colors. The Ciao comes standard with a Super Brush nib and a Medium Broad nib. These are the only two tips that will fit the Ciao. This is another double-ended marker, but with no additional nib options. Regardless, the Ciao comes with perhaps the two most versatile Copic nibs. The Super Brush comes to a point and can bend and flex. It is great for smooth blending and shading. The Medium Broad nib is is stiffer and has a chisel point. It works more like a highlighter; it’s great for filling in big areas. The thicker nib makes it more difficult to color in tight spaces, though. You can refill a Ciao marker fifteen times from one Various Ink Container. The Ciao is the smallest Copic marker, which means it gets the most refills from one ink container. Copic Ciao caps have holes in case children accidentally inhale or swallow them. The Ciao marker has a circular shape and is the most comfortable marker for smaller hands. The Ciao is the smallest Copic marker, which makes it great for kids and people with smaller hands. Many people find them to be the most comfortable Copics. The barrel of the marker is perfectly circular. This makes it easier to hold, but it also rolls around on flat surfaces. The Copic Classic is the marker that started it all. It is the original Copic design. 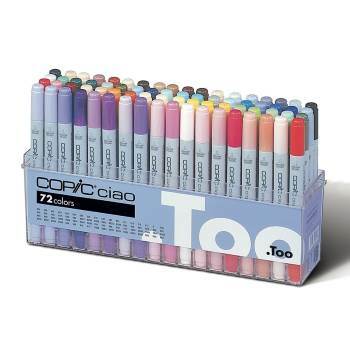 While both the Sketch and Ciao are considered the more popular choice for coloring, the Classic is a very similar marker that just gets less attention. With a larger color selection than the Ciao and more nib options than the Sketch, there are several reasons not to overlook the Classic. The Classic is a nice middle-ground between the Ciao and the Sketch in terms of color variety. With 214 available shades, you will have no trouble finding the Classic in the color you are looking for. You might assume that there are only 34 additional colors available to the Classic as opposed to the Ciao, but that’s not the case. There is not a direct overlap between the two color selections – certain colors are unique to the Ciao line and certain colors are unique to the Classic line. Unlike the other double-ended markers in the series, the Classic comes with different nibs. 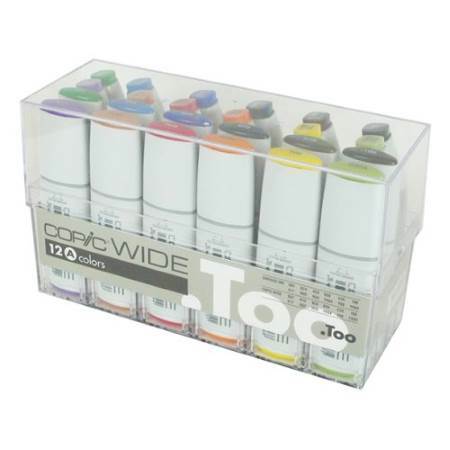 Out-of-the-box, these markers include a Standard Broad tip and a Standard Fine tip. The Standard Broad nib very similar to the Medium Broad nib that comes with other types of Copics. It is a little bit larger, but boasts the same firmness and slanted chisel tip that makes filling in larger empty spaces a breeze. The Standard Fine nib is a bit different. It is firmer, smaller, and rounder than the Super Brush nib, but is similarly used for detail work. While it is still an alcohol marker, the lack of the Super Brush nib makes the Classic less suitable for blending. Never fear, as there is a Brush nib that is compatible with Copic Classics. There are also 6 other additional nibs for you to purchase and experiment with. With a full set of nine unique nibs, the Classic can easily become the most versatile marker of the four. You can refill a Classic marker nine times from one Various Ink Container. The Classic’s ink capacity is second only to the Wide marker line. These guys can hold a lot of ink. If you want the longest-lasting Copic marker, look no further than the Classic. Copic Classics are large markers. They are the largest of the three double-ended Copic markers. Despite their size, they are still comfortable and easy-to-use in smaller hands. The square barrel keeps these markers from rolling around too much when placed on their sides. Still, the corners are rounded, so be careful jostling your coloring surface too much, or these markers could start moving. Copic Classics are definitely under-represented in the coloring world. Many colorists like Copics because of their incredible blending ability. While a blending nib does not come standard with the Classics, it can be purchased additionally. This tip will turn any Classic marker into a formidable blending tool. Considering the large array of colors and the unmatched variety of nibs, you’re doing yourself a disservice by not considering Copic Classics for your coloring toolkit. The Copic Wide is definitely the odd marker out in this set. While the Sketch, Ciao, and Classic all have similar shapes, features, and abilities, the Wide marker is quite different. With only a single coloring end and a large chisel tip, these are definitely markers with a specific purpose. While these markers are not all-in-one coloring tools like the other three, they have unique features that make them a great addition to any coloring supply collection. Copic Wides have a very limited color selection. 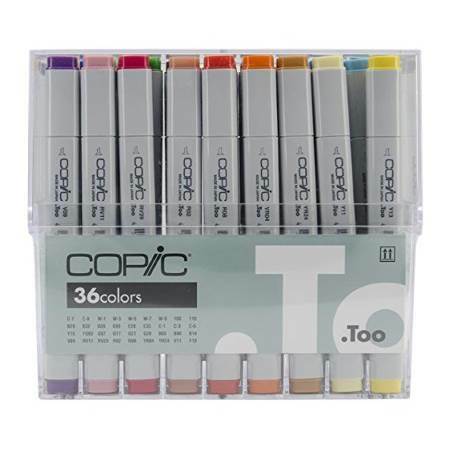 They are only available in 36 of the 358 colors in the Copic color palette. That is just over 10% – not the greatest selection. Still, the 36 different shades have good variety and are spread throughout the whole color wheel. The Wide marker is unique in that it only has single end for coloring. All other Copic markers are double-sided, with a different nib on each end. They come with standard with the Extra Broad nib. If you’ve been reading through the information on the other markers in the product line, you can probably guess what this nib is like. It is a firmer, angled chisel nib that is 3/4″ wide – far broader than the Medium Broad or Standard Broad nibs available on other markers. This nib makes the marker ideal for filling in large blank areas with even, uniform colors. The width of the nib allows you to cover the area in fewer passes. This means less opportunity for overlapping strokes, which will make your colors look smoother. Of all Copics, the Wide markers can hold the most ink. However, the wider nib also means that they lay down color at a faster rate than any of the other markers. As a result, these markers may seem like they run out of ink a bit faster than the others. An individual Copic Various Ink container holds enough ink to refill a single Wide marker seven times. 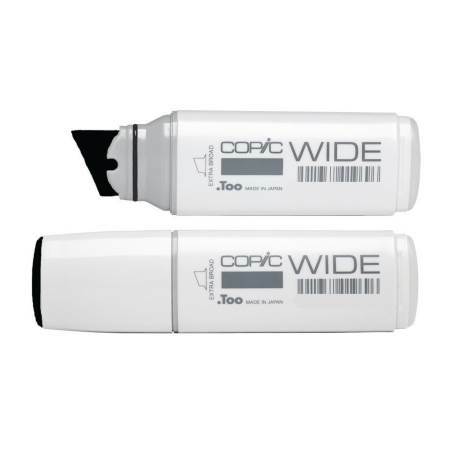 Copic Wides are large markers with a flat, ovular shape. This can make gripping the marker a little bit awkward, especially for those with little hands. Pinching the marker between your thumb and index fingers is the best way to hold it. This will allow you to make even, sweeping strokes and fill in large areas with precision. The oval marker barrel helps prevent these markers from rolling around when laid on their sides. Copic Wides will probably never be your primary coloring markers. Still, they have unique features that make them a valuable addition to your toolkit. No other marker will be able to lay down color as quickly or as evenly. When used in combination with other types of Copics, you can create some really gorgeous coloring creations. As you’ve already seen, each type of Copic marker offers something different. Each marker has pros and cons that make them suited for different types of art. Colorists love these markers, but they’re not the only ones. 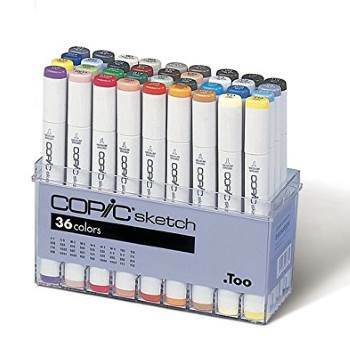 Copics are the gold standard for artists of all types, from designers and architects to graphic artists and comic book illustrators. You don’t have to limit yourself to just one type, either. Especially if you are just starting out, consider testing each type of marker to find out which one suits your coloring style. You’ll quickly find that each subset has its own merits. Different people like different markers for different reasons; we do our best to explain all the nuances in this article, but the best way to find your ideal match is to test them out! The Copic Sketch definitely dominates in terms of color variety. Still, 358 different shades is a huge selection to choose from. Unless you are seriously into color theory, you will probably find that the Ciaos and Classics provide more than enough different colors to meet your needs. When buying Copics for the first time, many people struggle with choosing a base set of colors. When you are just starting out, you want your initial set to cover all the major color bases. There’s nothing worse than getting half-way through a coloring page and realizing that you’re missing a color. Luckily, some of the pre-selected Copic marker sets do a good job of including all the major color groups. 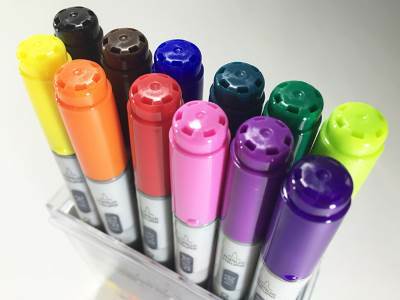 Copic’s color coding system also makes it easy to find the exact color you need when expanding your marker collection. Our interactive Copic marker color chart makes it easy to see which markers come in which colors. While most would not consider the size and shape of the markers as a key factor in determining which is best, it can matter to certain individuals. As anyone who has colored for hours on end will agree, comfort is important. If you’re going to invest a good chunk of change in a set of markers, you want to know that they will feel good in your hand. As you’ve read, Classics are the largest marker and have a square tube with rounded corners. If you color with a tight grip, these rounded corners can place a little bit of pressure on your fingers and knuckles. This isn’t a big deal at first, but can become slightly uncomfortable after a long time. This is generally less of an issue if you have smaller hands. The Sketches are slightly smaller, and have an ovular tube. Most people find this slightly more comfortable than the square Classics. However, since you are likely to be rotating the marker to take advantage of the different shaped nib, both of these markers may require slight adjustments to your grip as you go. The Ciaos are perfectly circular, which means they can be rotated in your hand without affecting your grip whatsoever. This, combined with their slimmer contour, makes for a very comfortable coloring experience. Many children and colorists with smaller hands get more precision due to the smaller shape. However, they’re circular shape also makes them more prone to rolling off of your coloring surface compared to other Copic markers. The Wides are the odd marker out in terms of size and shape. These markers are shorter and flatter than the others, which can make them difficult to manipulate. However, when pinched and held like a highlighter, they slide across the page with ease. Since colorists rarely use these markers for fine details, you don’t really have to worry about holding them for extended periods of time. While there are nuances to each type, every Copic marker is ergonomic and comfortable to use. Unless a medical condition seriously affects your hand’s comfort when coloring, you don’t need to worry too much about size and shape. Want to learn how the Copic color codes work? Click the characters in the code below to see what each one means. The first letter (or group of letters) determines the color hue. Codes that start with B are all blues, codes that start with G are all greens, and so on. If you have a marker you love but wish you had it in another shade, you want to look at Copics that start with the same letter. The first number determines the color saturation. This number can range from 0 to 9, and generally determines which colors are in the same blending group. If you are looking to add the smoothest gradients and transitions to your coloring pages, you should blend with colors with the same saturation number. The second number (or group of numbers) determines the color tone. Tone refers to how bright or dark a certain color is. This is generally a number from 0 to 9, but certain color families have tone values of 00 or even 000. Smaller numbers are brighter, and larger numbers are darker. If you are looking to add highlights or shadows to a color you already have, you should find a marker with the same hue and saturation values and a higher or lower tone value. It is recommended to keep 2 or 3 digits between tone values to produce ideal color contrast. Every color in Copic’s repertoire has a name in addition to an id code. Often the name of the color is easier to use. The color names tend to be accurate and descriptive. For those less familiar with the color coding system, it’s often easier to recognize the color from the name than the code. Having both the color name and the code can help when searching for a specific marker online or in a store. While they may seem like random letters and numbers at first, the Copic color code system actually provides important information on the shade, saturation, and brightness of all the different marker colors. Each part of the color id corresponds to a specific color quality. When you understand how the coding system is organized, you can easily find the color you are looking for, even if you are not sure if it exists. 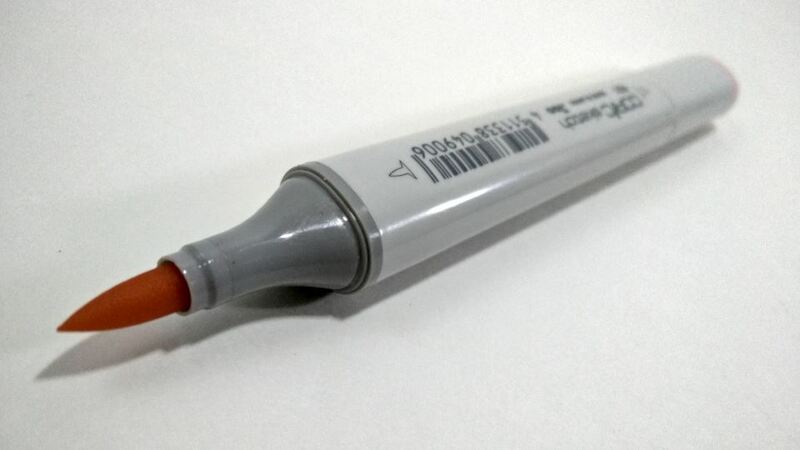 While Copics are top-quality markers, they also come with a top-quality price tag. It can sometimes be hard to justify the high price if you are not a professional artist or designer. While these are great markers for coloring, not every colorists has a ton of money to pour into their hobby. You probably know that Prismacolor makes some of the best pencils for coloring. You might not know that they also produce their own line of alcohol markers. These double-ended markers feature a fine tip and a chisel tip for variations in stroke weight. The alcohol and dye based ink makes them well-suited for blending, shading, and creating color gradients. 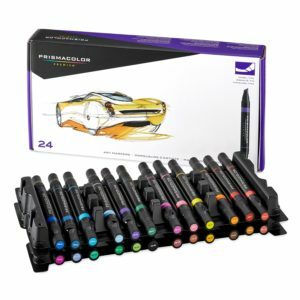 The complete set includes 200 different markers, which is a respectable variety of colors to choose from. Chameleon Pens are very unique and a great alternative to Copics if you are looking for a marker that performs amazing color blends. These are alcohol-based markers as well, but with a twist. 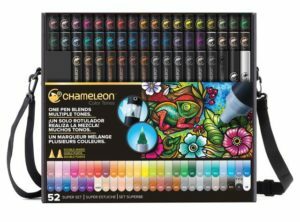 Chameleon Color Tones have a special system that allows you to seamlessly blend any two marker colors together. The pens are designed to interlock with one another, allowing the ink from one to flow into another. The result is a marker that will actually change color as you use it, allowing you to create amazing blends and shades with ink.